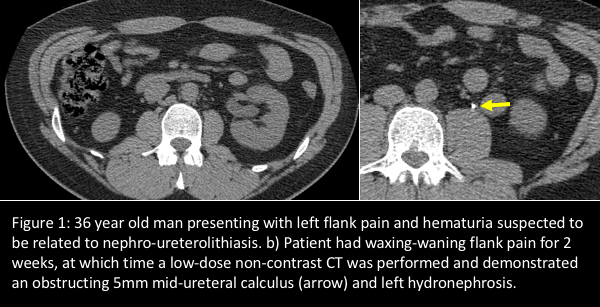 Computed tomography is the most commonly ordered imaging exam for patients with symptoms of obstructive nephro-urolithiasis. However, University of California-San Francisco (UCSF) abdominal radiologists recommend renal ultrasound as initial imaging study of choice for a patient with flank pain and suspected ureteral stones. Their recommendation differs from those of both the American Urological Association and the Agency for Healthcare Research and Quality, which call for CT in the evaluation of patients with acute onset flank pain. CT is proven to have high diagnostic sensitivity to the cause of flank pain and to detect other surgical emergencies. The tradeoff is radiation dose exposure, even under low-dose protocols. This is an important consideration for patients with urinary tract disease who may require repeat imaging. Lead author Priyanka Jha, MD, assistant professor of clinical radiology in abdominal imaging, and colleagues explain their recommendation of ultrasound, especially in the absence of pyuria, trauma, and/or signs of an alternative diagnosis, in Emergency Radiology. Their article summarizes current literature on state-of-the-art imaging, including conventional noncontrast CT, low-dose CT, dual-energy CT, MRI and ultrasound. The authors acknowledge that ultrasound sensitivity is operator-dependent, with a reported wide sensitivity range of 12% to 98%, and takes longer to perform than CT. They also point out that ultrasound can reliably detect renal stones greater than 5 mm, but has limited ability to detect stones smaller than 3 mm. They may also be difficult to detect in large-bodied individuals or when located in the mid-ureter due to the presence of overlying bowel gas. If a patient has persistent pain and the ultrasound is negative or inconclusive, they recommend a contrast-enhanced CT (Figure 1). In an interview with Applied Radiology, Dr. Jha said most UCSF emergency physicians use ultrasound as the primary imaging modality for flank pain thought to be related to stone disease. If CT is ordered, it is performed with a specific low-dose imaging protocol. “We perform renal ultrasounds for emergency department patients with increasing frequency. The most common alternative diagnosis, especially in the setting of right-sided flank pain, is appendicitis. In this circumstance, we have added a right lower quadrant ultrasound image for appendicitis. In female patients, a pelvic ultrasound may also be added on to evaluate for ovarian torsion, if included in the differential,” she said. “I reviewed a case of a patient who presented with right flank pain. The attending emergency physician ordered a renal and right lower quadrant ultrasound. 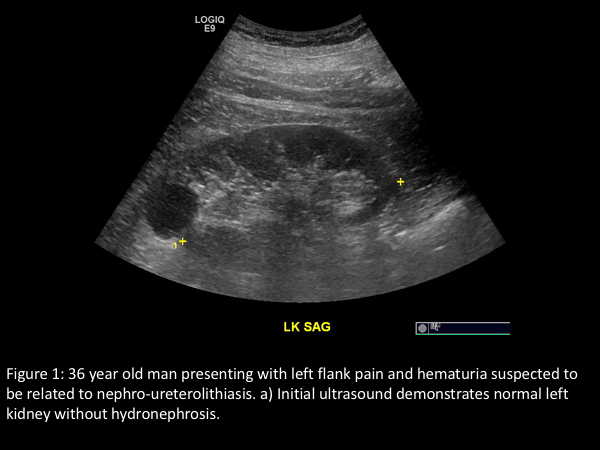 The patient had appendicitis and an ultrasound examination was sufficient for diagnosis (Figure 2). I also recently reviewed a CT in a male patient complaining of left flank pain and an obstructing 5 mm mid-ureteral calculus was identified. This patient had presented with the same complaint two weeks prior. However, a renal ultrasound performed at the time did not show any hydronephrosis and the patient was managed with symptomatic treatment. These represent two situations, one in which I made a diagnosis with ultrasound only and a CT could be avoided, and the other in which CT was subsequently appropriate,” she said. “We encourage the use of ultrasound for initial emergent work-up of flank pain suspected to be from nephro-ureterolithiasis. While the typical provider preference for ultrasound versus CT is dominated by personal experience, an evidence-based paradigm shift in managing this condition is eminent in the face of radiation concerns. The higher the clinical suspicion for stone-related flank pain, the likelier it is that an ultrasound can help direct management in the emergent setting,” Dr. Jha concluded. Jha P, Bentley B, Behr S, et al. Imaging of flank pain: readdressing state-of-the-art. Emerg Radiol. 2017 24;1: 81-86. Smith-Bindman R, Bailitz CAJ, Benjamin RN, et al. Ultrasonography vs. Computed Tomography for Suspected Nephrolithiasis. N Engl J Med. 2014 371: 1100-1110. Suspect flank pain? Consider ultrasound for first-line imaging. Appl Radiol.